Was Martin Parmer Really Called "The Ring Tailed Panther"
It's time for a reunion. 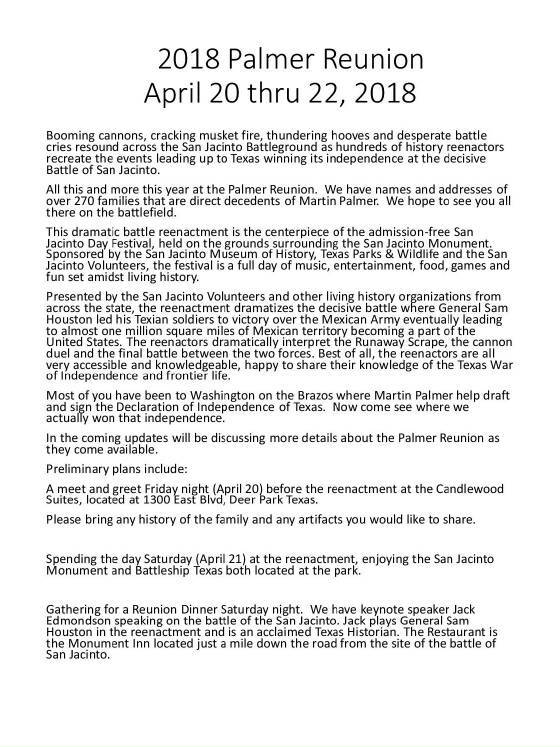 This year we will be celebrating the reunion at the San Jacinto Battle Reenactment the weekend of April 20th thru 22nd, 2018. The admission is Free. Bring all your family, kids, and grandchildren for an eventful weekend. See the attached flyer for more details. We have a hotel (Candlewood Suites) set up with a block of rooms with a special rate. Information and number is in the attachment. You need to call and reserve your room. Be sure to tell them your with the Palmer Reunion. We will have a meet and greet there Friday night. Bring your pictures and artifacts to share. Saturday the reenactment will be held at the San Jacinto Battlegrounds and Monument. It's a great show and there is tons of history inside the monument. The Battleship Texas is also right across the road if you haven't seen it. Saturday night we will have a banquet just down the street from the monument at the Monument Inn. We have Jack Edmondson who plays General Sam Houston in the reenactment as a guest speaker. Please contact Reggie Nalley or Gene Hennigan at the numbers and emails below if you have any questions. Please RSVP with your dinner meal selections asap for the banquet. Hotel Candlewood Suites, 1300 East Blvd., Deer Park, Texas 77536 We have a block of rooms available for your stay. Please call and reserve your room in advance. Mention your with the Palmer Reunion. We also have the conference room reserved for our meet and greet here. Banquet will be at Monument Inn, 4406 Independence Parkway South, La Porte, Texas 77571 See attached menu and prices. 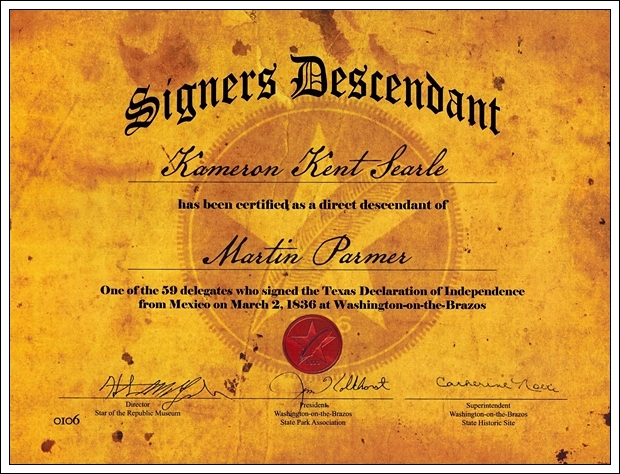 As a descendant of Martin Parmer, you are a descendant of a Signer of the Texas Declaration of Independence. The Descendants of the Signers of the Texas Declaration of Independence now have beautiful medallions for sale to display in your home or place on your ancestors' headstones. The medallions are $60 each plus $8.50 postage and available from Amber Folk, 8538 Laurel Trails Dr., Houston, Texas 77095, Ph. # 713-505-4250. You can save the postage/shipping costs if you pick your medallion up at this year's Texas Independence Day Celebration, March 3rd and 4th, 2017, at Washington on the Brazos. The medallions look like SRT and DRT medallions, but are only available to descendants of the signers of the Texas Declaration of Independence from Mexico. The first order is for only 40 medallions. So, if you want one or two, you need to order now. The first 40 may all be gone before the Descendants meet on March 3rd and 4th. See the link to the order form below. Be sure and friend the Palmer/Parmer Family Reunion on Facebook! 2016 Palmer/Parmer Family Reunion Set for Washington-on-the-Brazos and 180th Anniversary of Texas Independence. We will be holding the Palmer/Parmer Family Reunion at Navasota and Washington-on-the-Brazos on the first weekend in March of 2016. The people of Texas will be celebrating the independence of Texas at Washington-on-the-Brazos State Park on March 5 and March 6, 2016. This will be the first Palmer/Parmer family reunion in three years and it will also be Texas's 180th birthday, so the 2016 reunion ought to be a big one. Activities are being planned by the descendants of the Signers of the Texas Declaration of Independence and we will be fitting these activities and the events at the Park into the reunion itinerary. The 2016 Palmer/Parmer Reunion activities will be held in the Navasota VFW Hall located at 1575 W Washington Ave., Navasota, Texas, on Saturday, March 5, 2016 beginning at 9:00 a.m. A Lunch meal will be served at noon. We will have the VFW Hall throughout the day. Bring all your genealogy and family records to share with cousins. There will also be activities at Washington on the Brazos all day Saturday and Sunday. A dance with a live band has been planned for the evening of March 5, 2016 by the Descendants of the Signers of the Texas Declaration of Independence at the VFW Hall to help us celebrate Texas Independence. 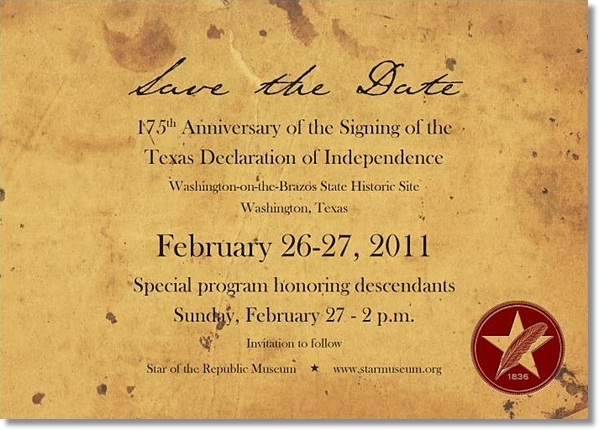 As an added bonus to coming to this year's 2016 Texas Independence Day celebration at Washington-on-the-Brazos, Descendants of the Signers of the Texas Declaration of Independence who are present at the Washington-on-the-Brazos State Park on March 5 or March 6, 2016 and purchase a Pioneer Family membership from the Washington-on-the-Brazos State Park Association will receive a copy of the beautiful book, "For the Love of Texas," which is an $80.00 value. As descendants of Martin Parmer, each of our families qualifies for this one-time special bonus offer. But you must be present at Washington-on-the-Brazos State Park on March 5 or March 6, 2016 and sign up for your Pioneer Family membership with the Park Association at the Park Convention Center to receive the book. No books will be mailed. You will receive the book that day. The Washington-on-the-Brazos State Park Association is trying to increase the number of Descendants who are members of the Park Association. The Washington-on-the-Brazos State Park Association works very hard year round to preserve the history and perpetuate the memory of what Martin Parmer and the other signers of the Texas Declaration of Independence did when they declared Texas independent of Mexico on March 2, 1836. The Park Association does a wonderful job of preserving the memory of Martin Parmer and let's help them do it. Come join the Washington-on-the-Brazos Park Association. * Subscriptions to informative newsletters: Notes and The Mustang. * Invitation to The Sundown Social, the annual Washington on the Brazos Park Association Benefit. * Invitation to the July 4th "Fireworks on the Brazos;" private reception and viewing party on the roof of Star of the Republic Museum, plus VIP parking. Thanks to Reunion Co-chair, cousin Tommy Palmer, we can already begin making reservations at the Comfort Inn and Suites in Navasota,Texas. To reserve a room, call Comfort Inn and Suites at (936) 825-9464. 20 Rooms have been blocked under "Palmer/Parmer Group Reunion" for each of the nights of Friday, March 4, 2016 and Saturday, March 5, 2016. As more details become available for the 2016 Palmer/Parmer Family Reunion,we will be providing more information here. Let's get together and celebrate what Martin Parmer and the other signers of the Declaration of Independence did at Washington-on-the-Brazos - "Where Texas Became Texas!" To assist Kameron Searle and Tommy Palmer with planning the reunion or to contribute funds to help offset the costs of putting on the reunion, contact us at ksearle1@pdq.net or tpalmer@brazoriainet.com. Both days: Independence Hall tours: 11a.m.,1p.m.,2p.m.,3p.m. and 4p.m. In addition to all the activities and events planned for the general public at Washington on the Brazos State Historic Site (Convention Hall, the Star of the Republic Museum and Barrington Living History Farm), there will be plenty of additional activities and events for the Descendants of the Signers of the Texas Declaration of Independence (The Descendants) who attend this year's 180th Texas Independence Day Celebration. On the evening of Friday, March 4, 2016 at 6:30 p.m., a reception will be held at the Star of the Republic Museum located at the Washington on the Brazos State Historic Site for the grand opening of the new museum exhibit, "A Legacy of Leadership: The Signers of the Texas Declaration of Independence." Elected as delegates to the Convention of 1836, our ancestors determined the future of Texas. The exhibit focuses on their roles as leaders and includes personal artifacts such as Sam Maverick's buckskins, a cameo of Michel Menard, oil portraits of Stephen Blount and his wife, the original diary of William Fairfax Gray and many others. The Descendants have been cordially invited to this grand opening. You do not want to miss the reception and premier of this new exhibit, so try and be at the Star of the Republic Museum Friday evening, March 4, 2016, by 6:30 p.m. Be one of the very first to see "A Legacy of Leadership: The Signers of the Texas Declaration of Independence." On Saturday, March 5, 2016, Washington-on-the-Brazos State Historic Site will open at 8 a.m. From 10 a.m. to 5 p.m. the Conference Center at Washington-on-the-Brazos State Historic Site will be the site of the 2016 Descendants Reunion. The Descendants will gather in the Conference Center where they will register and will receive a nametag indicating their ancestor's name. This will make it easier for you to locate cousins throughout the Park during the 180th Texas Independence Day weekend celebration. In addition to The Descendants' nametags, there will also be signs bearing the names of each of the signers of the Texas Declaration of Independence posted throughout the Conference Center to make it even easier for descendants of the same ancestor to meet with each other at the location where their ancestor's name is posted. The Conference Center will be open throughout the day for The Descendants to meet with cousins and socialize with the descendants of the other signers. Shelby Rowan, the genealogist for the Star of the Republic Museum, will be on hand to assist The Descendants with information about applying for membership in the Star of the Republic Museum's Descendants Registry program. The Descendants Registry is the official register of the documented lineal descendants of the Signers of the Texas Declaration of Independence. Once your lineage has been documented, that information will be maintained by the Star of the Republic Museum in perpetuity. Your descendants will only have to prove their relationship to you to have their names listed. If you have not already joined the Descendant's Registry, this would be a great opportunity to do so. Also, for a fee, Ms. Rowan will prepare a printed genealogical chart of your family back to your signer ancestor. If Ms. Rowan does not have your line, you will have the opportunity to provide that information to her so the Descendants Registry can be made more complete. So bring your genealogical data if you think it would be helpful. 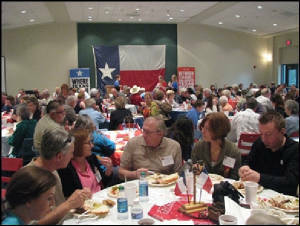 As all of the Descendants of the Signers of the Texas Declaration of Independence are eligible for membership in the Daughters of the Republic of Texas and the Sons of the Republic of Texas, representatives of these fine organizations will be on hand in the Conference Center with application forms and plenty of information on how you can join these wonderful lineage societies. If you have ever wondered how to join the DRT or the SRT, this is your chance. 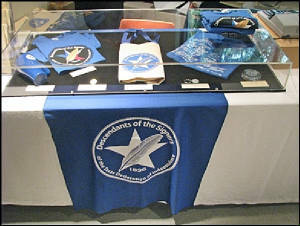 In the Conference Center, you will also have the opportunity to purchase Descendants of the Signers of the Texas Declaration of Independence merchandise (shirts, flags, mugs, paperweights, key chains, tote bags, etc.). All of The Descendants are strongly encouraged to join the Washington on the Brazos State Park Association (Park Association) this year for the historic 180th Texas Independence Day Celebration. This is a great way for each of you to honor what your ancestor did at Washington-on-the-Brazos. The Park Association raises and spends thousands of dollars each year to facilitate programs, celebrations, and education at Washington-on-the-Brazos State Historic Site, Independence Hall, Barrington Living History Farm, the Star of the Republic Museum and Fanthorp Inn. For example, since the 175th Texas Independence Day Celebration in 2011, the Park Association has supported a number of The Descendants' events and activities at the Park. The Park Association has shown their strong support for The Descendants; now it's time for The Descendants to show their strong support for the Park Association and all of the great work they do in telling the story of our ancestor's accomplishments at the site Where Texas Became Texas. This is a wonderful way to support the only organization dedicated to perpetuating the memory of what your ancestor did at Old Washington. ·	Subscriptions to informative newsletters: Notes and The Mustang. ·	Invitation to The Sundown Social, the annual Washington on the Brazos State Park Association Benefit. This year's Sundown Social will feature recording artist Michael Martin Murphey. As a special added bonus for coming to this year's 180th Texas Independence Day Celebration, The Descendants who are present at the Washington-on-the-Brazos State Park on March 5 or March 6 and who purchase a membership at the Pioneer Family level or higher in the Washington on the Brazos State Park Association, will receive a free copy of the beautiful book, "For the Love of Texas," which is an $80 value. "For the Love of Texas" is a gorgeous coffee-table book featuring photographs of Texas landscapes by Timothy Wolcott. This offer will not be available to the general public. As Descendants, each of our families qualifies for this one-time special bonus when you join the Park Association during the Celebration at the Park. At 5 p.m., the Park will close and The descendants are encouraged to grab a bite to eat in Navasota, Brenham or Chappell Hill and then come out to the Navasota VFW hall, Post #4006, 1575 W. Washington Ave. (Hwy 105), Navasota, Texas (when you get to the army tank your there), for the First Annual Descendants Dance which will begin at 6:30 p.m. Admission is free! There will be a concession stand selling drinks, chips and candy. The dance will end around 10 p.m. Be sure and bring the whole family. We'll have the party our ancestors did not get the chance to have when they were there in 1836. On Sunday, the Conference Center will be open from 10 a.m. to 2 p.m. for all The Descendants to gather, socialize, and take advantage the resources available (Registration, Descendants Genealogist, Descendants Registry information, Descendants merchandise, SRT membership information, DRT membership information, Join the Park Association, etc) before exploring and enjoying all the activities and events at the Star of the Republic Museum, Independence Hall and Barrington Living History Farm. At 2 p.m., the Conference Center will be closed and the Descendants will gather at the Park amphitheater for the "Roll Call"; of the names of the Signers of the Texas Declaration of Independence. The keynote speaker this year will be Texas State Senator Brandon Creighton, who is also a Descendant. Be there with your family to answer "HERE"; for your ancestor when his name is called. A messenger will also re-enact the delivery of the Travis letter from the Alamo by horseback. The Travis letter will actually be ridden across Texas to be delivered to Washington-on-the-Brazos as it originally was 180 years before on March 6, 1836. Remember, you do not have to be on the Descendants Registry to participate in all of these events, you just need to be descendant of a signer of the Texas Declaration of Independence which all of you are as descendants of Martin Parmer. "Not only did Houston dictate the plan of attack, he led the Texans' charge to within 20 yards of the Mexican position, astride Saracen, the fine gray stallion he bought from Isom Parmer. Both horse and rider were among the first casualties of the battle; Houston's tibia was broken by a musket ball and Saracen was struck numerous times and finally collapsed." 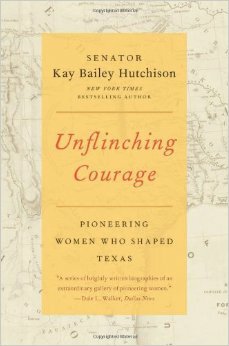 Quote from Unflinching Courage: Pioneering Women Who Shaped Texas, New York, HarperCollins Publishers, 2013, pages 89 and 90. Click here to read Sam Houston Rode a Gray Horse. We were unable to organize a Palmer/Parmer Family Reunion for 2015. If you would like to help organize a reunion for 2016, the 180th anniversary of Texas Independence, please contact Kameron Searle or Tommy Palmer. Even though we were not able to conduct a reunion in 2015, there were plenty of activities at Washington-on-the-Brazos this year on Sunday, March 1, 2015. The Descendants of the Signers of the Texas Declaration of Independence Luncheon was a huge success with a very large crowd in attendance and Lt. 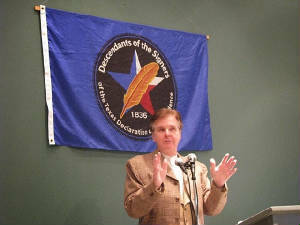 Governor Dan Patrick was the guest speaker following The Descendants luncheon. When "Sam Houston" did the roll call of the names of each of the signers of the Texas Declaration of Independence, the descendants of Martin Parmer shouted out "here!" Really cool stuff is happening for all the descendants of Martin Parmer up at Washington-on-the-Brazos. Everyone who attended the 2011 Palmer/Parmer Family Reunion will remember what a great time we had on the 175th anniversary of Texas independence. On that occasion, the Star of the Republic Museum recognized the Descendants of the Signers of the Texas Declaration of Independence. If you were there you will recall the Descendants of the Signers nametags, pins and blue T-shirts with the Descendants of the Signers logo on the front and the signers of the Declaration of Independence signatures on the back. Everyone who was there will also recall the roll call by “Sam Houston” of the names of the signers of the Texas Declaration of Independence and how Martin Parmer had the most descendants in attendance in the amphitheater. After the celebrations were over, many wondered what would happen to the Descendants of the Signers of the Texas Declaration of Independence and if the Descendants of the Signers would become something permanent or not. Great news! The Descendants of the Signers has grown since 2011 and is here to stay. 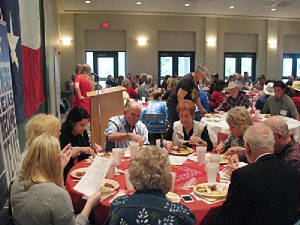 This year, prior to the 2014 Texas Independence Day celebration at Washington-on-the-Brazos, a luncheon was planned by a committee composed of several descendants of the signers. The 2014 Descendants event was a huge success. Representatives of the Star of the Republic Museum and the Washington-on-the-Brazos State Park Association spoke at the event, including Houston McGaugh, Shawn Carlson and John Fultz. There was a special guest speaker, Texas historian Michael R. Moore, who made a great historical presentation about Gail Borden, the Telegraph and Texas Register newspaper published at San Felipe and the details surrounding the printing of the original printed copies of the Texas Declaration of Independence. There was also some great Texas Bar-B-Q. But most important there were 250 Descendants of the Signers present at the luncheon!!! The Descendants of the Signers of the Texas Declaration of Independence luncheon for the 2015 Texas Independence Day Celebration at Washington-on-the-Brazos is now in the planning stages. Kameron Searle, a descendant of Martin Parmer is on this committee. The committee is planning on having as many as 350 Descendants of the Signers present for the 2015 event. 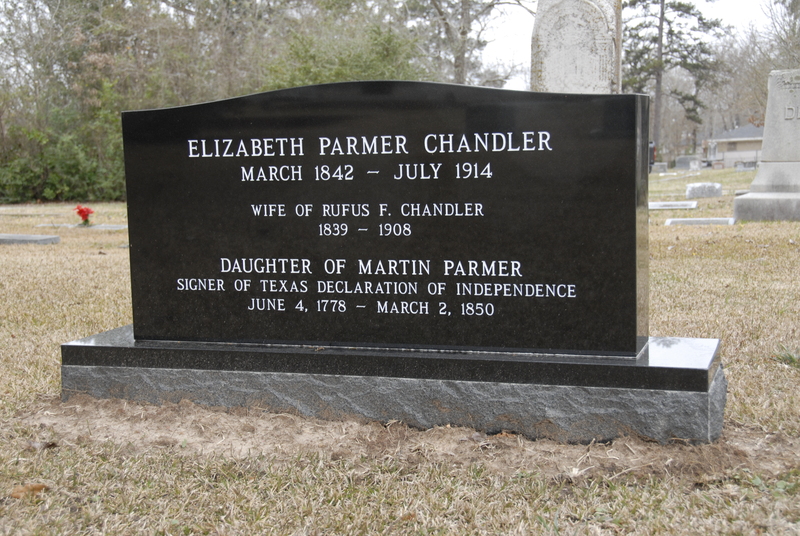 We would like to see as many descendants of Martin Parmer at the 2015 Descendants of the Signers of the Texas Declaration of Independence luncheon as possible. These tickets will be on a first come first served basis like they were for the 2014 luncheon which sold out early with many people still trying to send in their lunch money. Don’t miss out on the 2015 Descendants of the Signers luncheon by not purchasing your tickets early enough. As soon as the ticket information is available, the details on how to purchase them will be posted here. As was pointed out by John Fultz, the immediate Past President of the Washington-on-the-Brazos State Park Association, at the 2014 Descendants luncheon, Washington-on-the-Brazos is “Where Texas Became Texas!” We are descendants of one of only 59 signers of the Texas Declaration of Independence. Let’s make it an annual pilgrimage to Washington-on-the-Brazos to celebrate Martin Parmer’s very important role in the history of Texas. The Descendants of the Signers is growing and is going to be huge and we would like to see every descendant of Martin Parmer in attendance. As we did at the 2011 Palmer/Parmer Family Reunion, it would be great if Martin Parmer’s descendants had the largest crowd every year at the Descendants of the Signers luncheon. Perhaps we could tie the 2015 Palmer/Parmer Family Reunion into the 2015 Descendants of the Signers luncheon? More pictures of 2014 Descendants Luncheon. 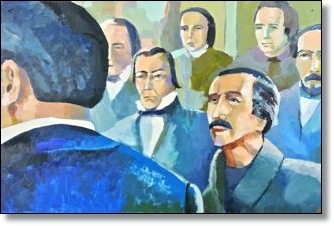 You can find out more information about the Descendants of the Signers by clicking the following link http://www.starmuseum.org/descendant . Have you gotten your name and your children’s names on the Descendants of the Signers Registry yet? What is “The Registry” you may ask? The Registry is the official list of the Descendants of the Signers of the Texas Declaration of Independence. It was begun in 2011 and is growing. There is an application/genealogy form and a fee. The fee helps with processing the application/genealogy form and includes a one-year membership in the Washington-on-the-Brazos State Park Association. As descendants of Martin Parmer, all of us should be members of the Washington-on-the-Brazos State Park Association which does so much to support the Star of the Republic Museum and the Washington-on-the-Brazos State Park Historical Site including Independence Hall, the site where Martin Parmer signed the Texas Declaration of Independence. We do want to have more Martin Parmer descendants on The Registry than any other signer’s family. It’s a Martin Parmer thing! In an act of friendly competition with the descendants of the other signers, we believe Martin Parmer's descendants should try and have more descendants listed on the The Registry than any other signers family. As of right now very few descendants of Martin Parmer are listed on The Registry. And of course we cannot let this continue. Get your applications in as soon as possible. Add your self, your children and your grandchildren. Let's try to add the names of as many Martin Parmer descendants to The Registry as we can before the next Descendants luncheon in 2015. It is very important to remember that, at this time, you do not have to be on The Registry in order to attend the annual Descendants luncheon. It is also important to remember that The Registry application fee does not get you a ticket to the luncheon. The Descendants luncheon meal ticket is a separate fee. To fill out lineage work sheet, click on this link http://www.starmuseum.org/signers_descendants/lineage_worksheet.pdf . When we moved to Lufkin in 1966, my grandmother, Jennie Moren Courtney, told me that her grandmother was buried in Lufkin, that she had died while visiting family and been buried there. I went on a search for my great grandmother and found her through the archives at Oakley-Metcalf Funeral Home, now Gibson Funeral Home. There was no monument on her grave, but we knew where she was buried from their records. These many years later, I decided if I didn't put up a monument it would never be done, so I set out to do that. First, though, I needed to establish the lineage for entry into the Daughters of the Republic of Texas as well as give correct information on the monument. So I pursued both ends, with the help for DRT membership from Johnnie Jo Dickenson of Huntsville, a fantastic researcher for whom the genealogy room of the Huntsville Library is named. We hit a snag when we could not find a connection between my grandmother and her mother, who was the Martin Parmer descendant. My grandmother had fallen between the cracks of the censuses when she would have been in their household. While searching in the Trinity County Courthouse in Groveton for clues about this lost link and not finding anything, I happened to run across my grandfather's name in the deeds index. Curious, I looked up the deed to see what he had sold and discovered written there that J. P. Courtney and his wife, Jennie Moren Courtney, had sold 75 acres to her parents, Joel Conway Moren and Cornelia (Nelia) Chandler Moren. There it was! The connection showing my grandmother was the daughter of Cornelia. So the connection was made to satisfy DRT connections. 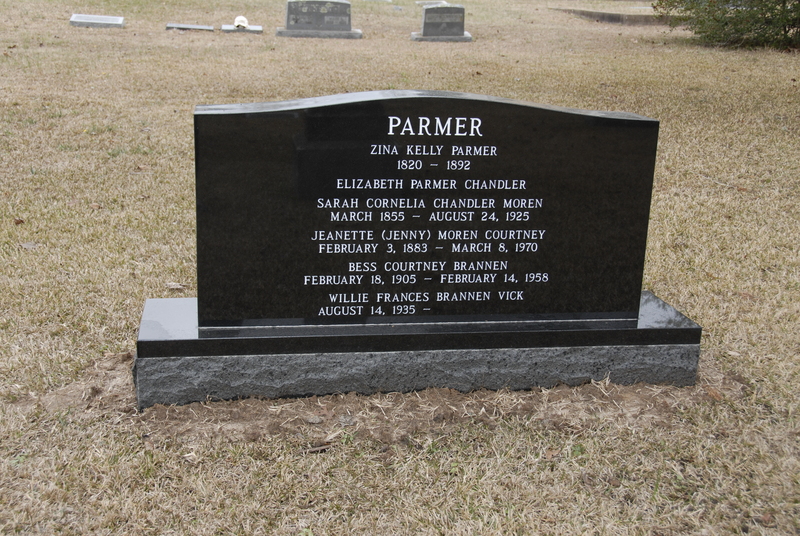 To be sure the following generations would not have this problem, I put the lineage from Martin Parmer on the back of the monument over my great grandmother's grave. It pleases me, that the descent is all female after Martin himself. My children insisted that I put my name on there so there would be no mistake in the lineage. Hospitality Room 7-9 p.m. Friday evening at the Days Inn & Suites in Huntsville. The 2013 Reunion Will Focus on Palmer/ Parmer Family Genealogy!!! Reunion Begins March 2, 2013 at 9:00 a.m. and Will Continue until 5:00 p.m. in the Community Room of the Huntsville, Texas Public Library. The Huntsville Library has WIFI access, so if you have a laptop, be sure and bring it along. If you get into Huntsville early on Friday, you might want to drop by the Walker County courthouse. Martin Parmer's estate papers are there and if you descend from one of Martin's many children who lived in Walker County, you may find a wealth of information about that ancestor too. The Walker County Courthouse will be closed on Saturday. appear on the Tribal Pages web site yet, bring it with you and we will add it and scans of your family pictures to the Tribal Pages web site during the reunion. We will celebrate Texas Independence Day, Sam Houston's Birthday, and We Will Remember the Day Martin Parmer died. Be sure and let alll the Palmer/Parmer cousins know about the 2013 Reunion. 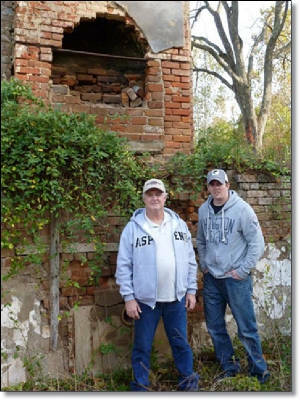 Cousin Tommy Palmer will be making a presentation about his recent visit to the Palmer Plantation outside of West Point, Virginia this year. Cousin Kameron Searle will be speaking about Martin Parmer's presence on the Internet on sites such as Wikipedia and changes that can and should be made. He will be soliciting your ideas and computer expertise. Hotel rooms for the 2013 Palmer/Parmer Family Reunion have been reserved at the Days Inn & Suites in Huntsville, Texas. 40 Rooms have been blocked under "Palmer/Parmer Reunion" for each of the nights of Friday, March 1, 2013 and Saturday, March 2, 2013. Call the Days Inn and Suites at (936) 438-8400 to reserve your room. Map to Huntsville Public Library and Information about the Community Room. 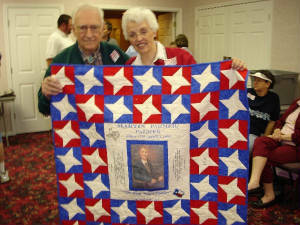 The Martin Parmer Family Reunion quilt sewn by Frances Goforth for the 2005 Palmer/Parmer Family Reunion will be on display in the Johnnie Jo Sowell Dickenson Genealogy Room of the Huntsville Public Library. Many of you who attended the 2005 reunion will remember signing this quilt. The quilt was donated to the Johnnie Jo Sowell Dickenson Genealogy Room of the Huntsville Public Library when cousin Frances Gorforth passed a few years ago. 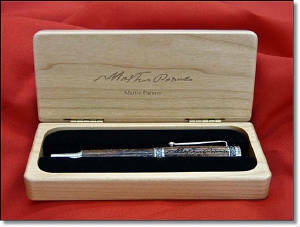 The one of a kind Panel 37 from the 2011 Mural of the Reading of the Texas Declaration of Independence portraying Martin Parmer will also be on display along with the one of a kind signers pen with Martin Parmer's autograph engraved upon it. Both of these items were custom made for the 175th celebration of Texas Independence held at Washington-on-the-Brazos on March 2, 2011. You Tube Video of Palmer/Parmer Cousins Behind Rolling Thunder Cannon and Cousin Kameron Searle Firing Rolling Thunder in Period Attire. 2011 Palmer/Parmer Family Reunion Was a Huge Success !!! Reunion Founder Taylor Pendley Declared This Year's Reunion "The Largest Ever!!!" The Webmaster Will Load Some Pictures From This Year's Reunion Here on the Front Page and Create a 2011 Reunion Page Later. Reminder! Please Bring Items to Donate for the Silent Auction on Saturday Night as a Fundraiser for the 2013 Palmer/Parmer Reunion!!! 160 Cousins from All Over the United States Have Already Confirmed for the 2011 Palmer/Parmer Family Reunion So Far! We Hope to See You There As Well!! We have already outgrown the first venue for the reunion and we will be meeting for the Saturday evening meal and reunion activities at the First Baptist Church, 301 Church Street, Navasota, Texas (Saturday Evening, February 26, 2011). Following the meal on Saturday evening, our speaker will be cousin, Kameron Searle, who will talk about Martin Parmer's many activites and important roles at the Independence Convention at Washington-on-the-Brazos in March 1-17, 1836. Friday, February 25, 2011 - Evening "Meet and Greet" at Comfort Inn Hotel. Saturday, February 26, 2011 - Morning and Afternoon at Washington-on-the-Brazos. Evening - Reunion and Dinner at First Baptist Church in Navasota. February 27, 2011 - Afternoon Sunday Ceremony Honoring the Descendants of the Signers of Texas Declaration of Independence at Washington-on-the-Brazos. Special News! Texas Declaration of Independence Signed by Martin Parmer Will Be on Display in Austin, Texas Now until April 21, 2011. Click Here for Details. The 2011 Palmer/Parmer Family Reunion is being organized by cousins Valerie Wood and Katherine Serna. Valerie's telephone # is (903) 536-2229 and her email address is valeriesbunch@aol.com . Katherine's email address is serna_77541@yahoo.com . The 2011 Palmer/Parmer Family Reunion will be held at Navasota, Texas and Washington-on-the-Brazos on February 25th, 26th and 27th, 2011. The reunion is open to descendants of Martin Parmer and the descendants of Martin Parmer's siblings. Hotel reservations can be made with the Comfort Inn in Navasota, Texas where a number of rooms have been blocked. Because of the ceremony for Descendants of the Signers of the Texas Declaration of Independence on Sunday, February 27, 2011, we are recommending that you get hotel rooms for the nights of February 25th and 26th. The Comfort Inn's telephone # is (936) 825-9464. Since this will be the 175th anniversary of the signing of the Texas Declaration of Independence, we recommend you make your room reservations early. Click on the links to the two important pdf files below with the most up-to-date information about the 2011 Palmer/Parmer Reunion. Click Here for 2011 Family Reunion Schedule Flyer pdf. More Special News: The Star of the Republic Musuem Invites the Descendants of Martin Parmer to Leave Their Comments on Their New "Signers Forum." 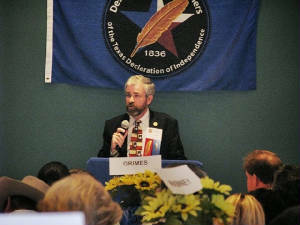 Click Here to Leave Your Comments about the 2011 Reunion, the 175th Anniversary of the Texas Declaration of Independence and/or Palmer/Parmer Genealogy Information for Other Family Members. Descendants of Signers to Be Honored at Washington-on-the-Brazos! 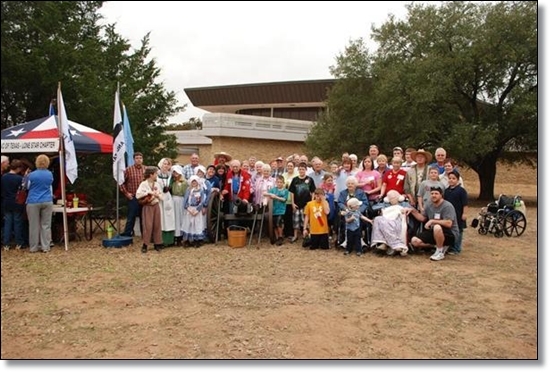 Special Program for Descendants at Washington-on-the-Brazos, Sunday, February 27, 2011, at 2 p.m.
Help Us Update the 2011 Reunion Email List ! As email addresses are constantly changing and our reunions are two years apart, our email list has gotten terribly out of date. If you would like to be included in emails regarding the 2011 Palmer /Parmer Family Reunion in Navasota and Washington-on-the-Brazos, please send your current email address to the reunion organizers: Valerie Wood at her email address valeriesbunch@aol.com and/or to Katherine Serna at her email address serna_77541@yahoo.com . Click Here to See 2009 Reunion Photos ! Daniel Hill Book, Martin Parmer; Lion of the West Update! and with the Kansas City Public Library "Missouri Valley Special Collections." The updated book has incorporated a bunch of new findings and updates, from my 2009 research trip. The new edition has a complete index, a host of new figures giving time-period documentary evidence, new photographs of Parmer/Palmer homesites in Missouri, Arkansas, Kentucky, and Virginia, complete Bibliography and Endnotes, extensive family group information in the Appendix as well as listing of all Martin Parmer family residence locations with GPS coordinates, complete credits and Preface including all information about my research, and corrections throughout all chapters and with improved narrative to make the story flow smoothly from chapter to chapter. My problem at present is, although I have the names of all the original rough-draft book recipients, I don't have mailing address information for most of you. Please send me your name and mailing address, and your original copy registration number from the back page (p.531) of your "rough-draft" copy, and I will see to it that you receive the new addition as soon as it is ready. 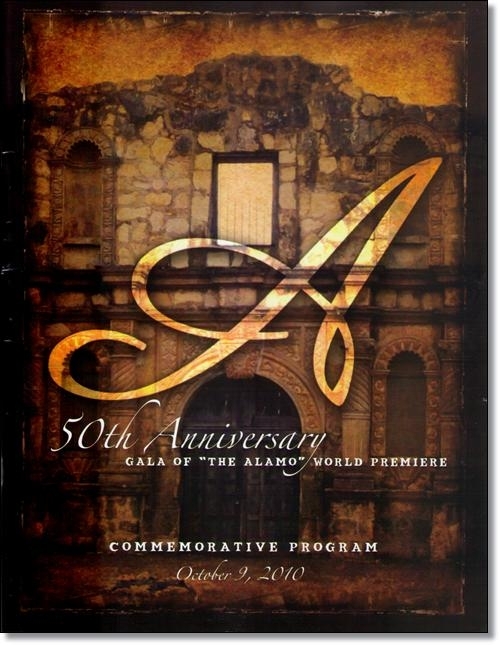 The 50th Anniversary Gala of John Wayne's movie, "The Alamo" world premiere was celebrated at the Alamo on October 9, 2010 by the Daughters of the Republic of Texas. 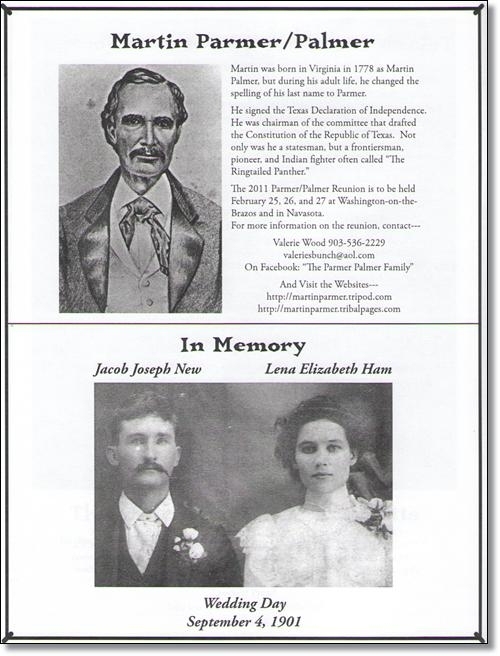 A half page advertisement for the 2011 Palmer/Parmer Family Reunion appeared in the Commemorative Program for this event. Special thanks and congratulations go out to our cousin, Judy Tannehill, for her efforts to make the Commemorative Program for this event such a huge success and for helping the 2011 Palmer/Parmer Family Reunion to place an advertisement in this wonderful publication. Our thanks also go out to all of you who contributed towards the $200 cost for the placement of this advertisement. Below is the advertisement as it appeared in the Commemorative Program. 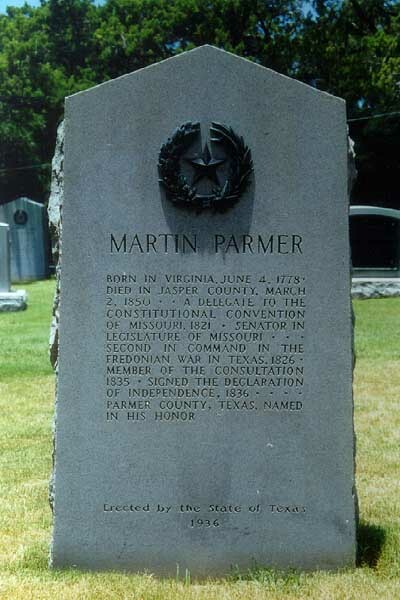 Martin Parmer was born in Virginia in 1778 as Martin Palmer, but during his adult life, he changed the spelling of his last name to Parmer. He signed the Texas Declaration of Independence. He was chairman of the committee that drafted the Constitution of the Republic of Texas. Not only was he a statesman, but a frontiersman, pioneer, and Indian fighter often called "The Ringtailed Panther." 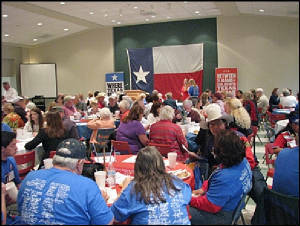 The 2011 Parmer/Palmer Reunion is to be held February 25, 26, and 27 at Washington-on-the-Brazos and in Navasota. On Facebook: "The Parmer Palmer Family"
The Star of the Republic Museum at Washington on the Brazos is looking for descendants of the 59 signers of the Texas Declaration of Independence for a special ceremony at the 175th anniversary of Texas Independence next year (2011). All descendants of Martin Parmer are eligible for this special ceremony. We are encouraging all descendants of Martin Parmer to contact Dr. Shawn Carlson at The Star of the Republic Museum at Washington on the Brazos State Park so that we will all be on the Star of the Republic Museum's mailing list for this exciting event. The Star of the Republic Museum needs your ancestor's name (Martin Parmer), your name, mailing address, telephone number and email address. Plans are in the works to attempt to combine the descendants ceremony with the Palmer/Parmer Reunion if possible. Shawn B. Carlson, Ph. D.
If we do not have your genealogical information on the Martin Parmer Family Tree at: http://martinparmer.tribalpages.com, then be sure and bring your genealogy data, photos and other information to the reunion. We will be bringing a computer and a scanner, and if we can get a computer connection we will be putting your data online right there at the 2011 reunion. 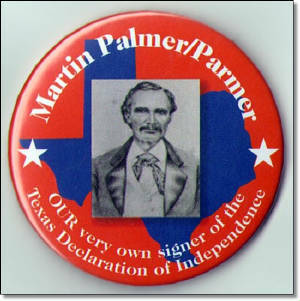 "Martin Parmer - Agent for Texas"
We are the descendants of Martin Parmer and his siblings. On this home page you will find information regarding the Palmer/Parmer Family Reunion which is held every two years. See the Martin Parmer Family Tree at the link below. If your family line is not on it, then you need to send me your line. Or bring copies of your ancestor charts and pictures to the reunion in March. See the page for more details. We will also highlight the life and the many historical contributions of Martin Parmer, his ancestors and his descendants in the history of the United States and Texas. "A small party of infatuated madmen at Nacogdoches have declared Independence and invited the Indians from the Sabine to the Rio Grande to join them and wage a war of Murder, plunder and desolation on the innocent inhabitants of the the frontier--The leader of this party is Martin Parmer..." Stephen F. Austin to the Citizen's of Victoria - Letter dated January 1, 1827 regarding Fredonian Rebellion. "...Palmer was a man of more than ordinary parts, of most extraordinary strength of mind and body and brave as a lion. He was of large stature and bronzed of feature, always dressed in buckskin hunting shirt and leather trousers, with a panther skin cap, wore his hair long and platted in Indian style, and was indeed a unique figure. I first saw the 'Panther' at our home on Taylor's Bayou and he impressed me as a most extraordinary character. "On this occasion the'Panther' was well mounted and armed, and in high glee, eager for a brush with the enemy;..." Creed Taylor - Texas Revolutionary War veteran and Texas Ranger regarding Martin Parmer's military service at the first battle of the Texas Revoution at Gonzales on October 2, 1835. "On motion of Mr. Everitt, the house went into an election for officers for the provisional government. Mr. Martin nominated for governor, S. F. Austin. Mr. Parmer nominated for governor, Henry Smith. Mr. Everitt nominated for lieutenant governor, J. W. Robinson. Whereupon, Mr. Henry Smith was declared duly elected governor, and J. W. Robinson, Lieutenant governor." Journals of the Consultation at San Felipe de Austin, November 12, 1835. Henry Smith was the first American Governor of Texas and Martin Parmer nominated him for the position against Stephen F. Austin. 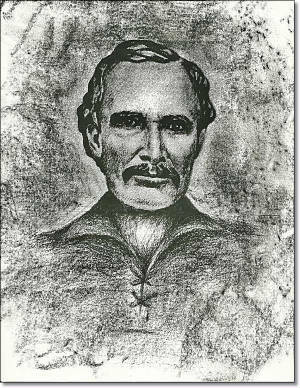 "Mr. Parmer gave an interesting account to his friends at Old Washington in 1836 of his escape from San Antonio. He was a wonderfully fascinating talker and his recital of this even greatly amused those who heard him. He was a man absolutely without fear and held the Mexicans in contempt." Charles B. Stewart - First Secretary of State of Texas - Delegate to the Convention at Washington - Signer Texas Declaration of Independence. "Mr. Parmer was of a nervous temperament. He had a stubborn and determined will and showed impatience of delays. Many interesting stories were told of his prowess among the Indians. He was an interesting talker and was frequently seen in the midst of an admiring group, relating incidents of his adventures. He was a unique character but with all he was a man with the best of impulses - honest, brave and heroic." Col. Stephen Blount - Delegate to Convention at Washington - Signer Texas Declaration of Independence. 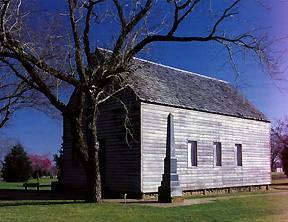 The 2003 Palmer/Parmer Reunion included a tour of Independence Hall located at Washington-on-the-Brazos. Though only a replica, Independence Hall is constructed on the exact spot where Martin Parmer signed the Texas Declaration of Independence in March, 1836. Martin Parmer's signature on the Texas Declaration of Independence can be seen on the Internet by clicking the link below. Parmer's signature can easily be found by locating Sam Houston's signature and counting down three signatures. Hope to See You in 2011! !